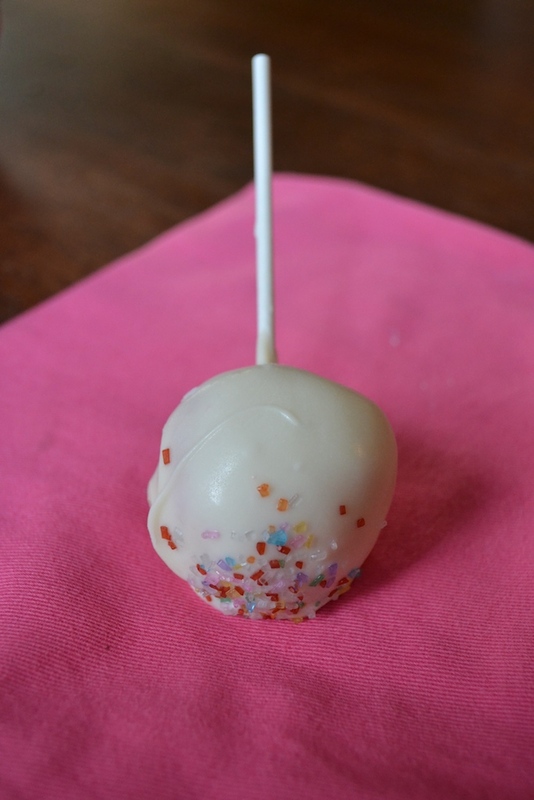 When I first learned of cake pops, I have to admit I wrote them off as a short-lived fad. Even when they appeared in the Starbucks pastry case, I still didn’t think much of them. From a quick google search, I learned they are made by mashing cake with icing to form a dense mixture that is then dipped in a chocolate bark coating. Any food stuck on a stick is sure to get a boost in ratings and the fact that cake pops can be decorated creatively somewhat explains their popularity. Yet, I still wondered, why not just eat cake? Mashed cake and frosting sounded more like a 1 year old’s birthday party then a subject worthy of blogs (like this one) being dedicated to it. And then I got the phone call. Right before Christmas, a father called me about doing a baking class for him and his 12-year old daughter. His daughter loves to bake and when I talked to her on the phone about what she wanted to cover in the class, I quickly learned that she also was a girl that knows what she wants. A lattice-topped pie, eclairs, and cake pops were all on her list. As I started to research how to make cake pops, I quickly discovered that these fanciful treats most often begin with a box cake mix and a carton of cream cheese frosting. These products are great when you are in need of a quick fix, but I wanted to make a cake pop from scratch and decided to attempt to make cake pops with my favorite yellow cake recipe and my classic cream cheese frosting. The result? I’m still not real keen on the whole concept. It’s the mashing of the perfectly good cake with perfectly good frosting that keeps me from getting too enthusiastic about the end product. Yet I have to admit cake pops are pretty darn delicious and they are a lot of fun to make. They also are a huge hit with kids which is something that should never be underestimated. Older children can participate in making and decorating the cake pops and kids of all ages will enjoy taking a bite of cake in lollipop form. With the use of different food colorings, cake pops transform into the perfect treat for any holiday and I challenge you to find leftovers when you stick a bunch of these in a jar at your next birthday party. Shoot, if I didn’t know any better, I’d think this fad might have staying power. Place a rack in the middle of the oven and preheat the oven to 350 degrees. Grease the 13 x 9-inch baking pan with butter and dust with flour. Set aside. Place the softened butter and sugar in the bowl of an electric mixer. Beat with the paddle mixer on medium-high speed until the butter and sugar are light and fluffy. Add the eggs one at a time beating after each addition. In a medium bowl, whisk together the flour, baking powder and salt. Add the flour mixture in three additions; add the milk after the 1st and 2nd addition of the flour mixture. Add the vanilla extract and beat until combined. Pour the batter into the prepared baking pan and smooth the top with a rubber spatula. Bake the cake for 25 to 30 minutes until a skewer inserted in the thickest part of the cake comes out clean. Remove from the oven and let cool on a wire rack. 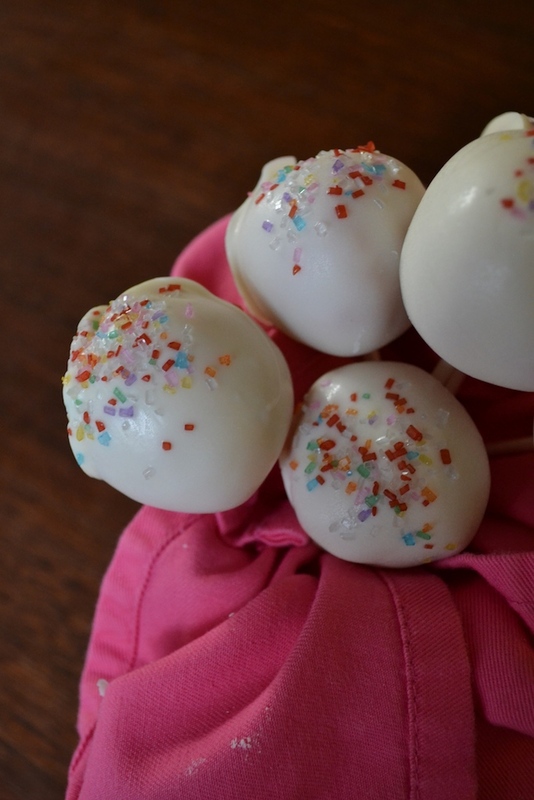 Note: You will only need half of the sheet cake (about 4 cups) for this recipe of cake pops. You can double the frosting and chocolate-coating portions of this recipe or simply freeze the remaining cake in an airtight bag or container for use at a later date. While the cake is cooling, prepare the cream cheese frosting by beating the cream cheese and butter in the bowl of an electric mixer fitted with a whisk attachment until smooth. Slowly add in the confectioners sugar beating until combined. Beat in the vanilla extract and food coloring if using. Line a small baking sheet with wax paper. Place four cups of crumbled cake in a large bowl and add about ¾ cup of cream cheese frosting. Mash together the cake and frosting to the consistency of play dough – you may need to add more cream cheese frosting to reach the right consistency. Shape the dough into approximately 20 golf-ball size balls and place the balls on the wax paper-lined baking sheet. Once all the balls have been formed, place them in the refrigerator to chill for at least one hour. When the cake balls have properly chilled, place the chocolate bark in a microwave-safe bowl and microwave for 30 seconds. Stir the chocolate and then return it to the microwave for another 30 seconds. Continue microwaving in 30-second increments, stirring after each addition, until the chocolate is completely melted. Remove the chilled cake balls from the refrigerator and put a stick in each ball. Dip the chilled cake balls into the melted chocolate to coat and return to the lined baking sheet. Decorate with sprinkles while the chocolate coating is still soft; it hardens quickly. Allow the chocolate-coating to harden before storing or serving. 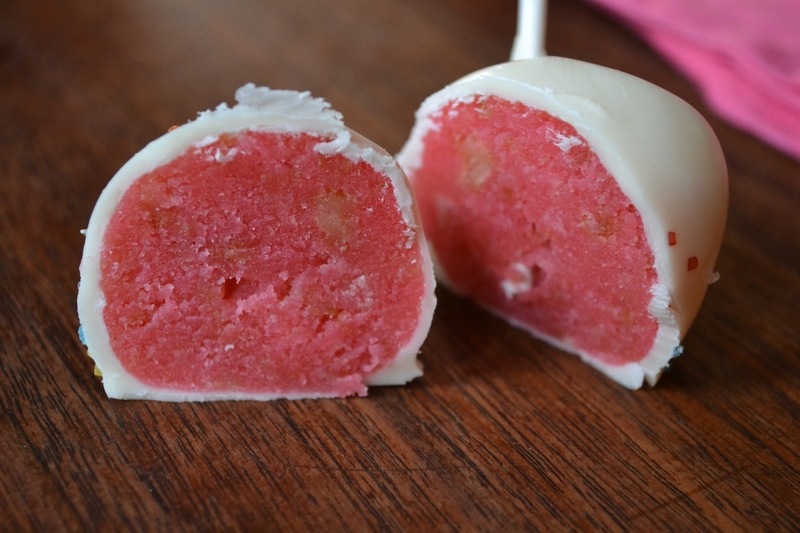 Cake pops can be frozen for up to 3 months. These are delicious! Although messy, I will definitely be making again! THis looks like an amazing recipe! Yay for Real butter! What do you consider chocolate bark? At my local store in the bulk baking section we have chocolate melts, would that work? A huge yay for real butter. Chocolate melts are interchangeable with chocolate bark – both will work great with this recipe. Happy baking! I will definitely make this for a vanilla version! I want to try a chocolate one also… can I use a buttercream frosting?